Thousands of Allied forces landed on the beaches in northern France. As people remember the 65th anniversary of D-Day, we offer a brief reminder of what the campaign was all about. D-Day was the first day of the Allies' campaign to liberate Nazi-occupied north-west Europe. At the time, Operation Neptune, as the assault stage of the campaign was known, was the largest military operation ever attempted. It involved simultaneous landing of mainly US, British, and Canadian forces on five separate beachheads in Normandy, France. Shortly after midnight, three airborne divisions - the US 82nd and 101st and the British 6th, numbering over 23,000 men - take off to secure the flanks of the beaches. En route are myriad naval vessels and landing craft. On their way to France they rendezvous in the Channel at 'Piccadilly Circus'. Thoughout the night positions on the invasion beaches are bombed, although many miss their target. From 06:30, the first five assault divisions are delivered to their beaches under cover of a fierce naval bombardment of the German shore defences. The British and Canadians land at beaches codenamed Gold, Juno and Sword, and the Americans at Omaha and Utah. A wide range of innovative methods are used to overcome the dense beach defences put in place by the Germans. 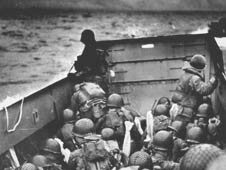 Throughout the day, over 75,000 British and Canadian troops and 57,000 US troops are landed on the beaches, from nearly 7,000 ships and landing craft. By midnight the Allies have secured their beachheads and pushed further inland from Gold, Juno, Sword and Utah. Stiff resistance at Omaha slows up the advance though by midnight US forces have secured several key locations. More than a year in the planning, D-Day was originally intended to begin on 5 June, judged to be the most likely day to combine calm seas, a full moon and low water at first light. But storms forced Supreme Allied Commander Gen Dwight Eisenhower to put it back 24 hours to start on 6 June. Airborne troops were dropped behind enemy lines in the early hours while thousands of ships gathered off the Normandy coast in readiness for the main attack. Though they were expecting an invasion, German military leaders believed the initial attacks were only a diversionary tactic. A brilliant Allied deception plan in the weeks ahead of the attack led them to expect the main invasion farther along the coast. The surprise element helped British and Canadian troops in particular establish footholds at beaches codenamed Gold, Juno and Sword. American soldiers also managed to land on the westernmost beach - Utah - without major casualties. But at nearby Omaha, they suffered severe losses. The Allied naval barrage and bombing raids on the German defences had proved ineffective and the Americans encountered a crack division of German troops. How many troops took part? Some 6,000 ships and landing craft were involved, delivering a total of 156,000 men and 10,000 vehicles to the five beaches along the carefully selected stretch of the Normandy coast. The landings would not have been possible without the support of massive air and naval forces which were much stronger than the Germans. On D-Day alone, as many as 4,400 Allied troops died. Some 9,000 were wounded or missing. Total German casualties on the day are not known, but are estimated as being between 4,000 and 9,000 men. Thousands of French civilians also perished, mainly as a result of Allied bombing. Though the Allies had gained a foothold in France at the end of D-Day, for a while they were at risk of being pushed back into the sea. The Allies had to race to build up their invasion force faster than German commanders could move up reinforcements. Once the beaches were secure, progress through the narrow lanes and staunchly defended towns of Normandy was slow. But with the Allies outnumbering their enemy and supported by their air superiority, they were able to overcome the considerable resistance - though at a heavy price. By the time they crossed the Seine and liberated Paris in late August, around 10% of the Allies' two million troops had been killed, wounded or were missing. What was the significance of D-Day? Much rode on the success of D-Day. Russia was making progress towards Berlin from the East. The Allies, already fighting in Italy in southern Europe, needed to open another front in the west to help defeat Germany. On the eve of D-Day, the Allied leadership was deeply concerned that it might not succeed. Eisenhower had already written a letter accepting full responsibility if D-Day turned out to be a disaster. Churchill had assured him that they would go together. But it was a crucial turning point in the war, and D-Day marked the opening shot of Operation Overlord, the ultimately successful campaign to liberate western Europe from German occupation. D-Day veteran: "The horror I saw"